Sister Immaculata Mary Jerome, I.H.M. Sister Immaculata Mary Jerome, I.H.M., died in Nazareth Hospital on May 3 in the 59th year of her religious life. She was 80 years old. Born in Atlantic City, N.J., she entered the Congregation of the Sisters, Servants of the Immaculate Heart of Mary in 1957 from St. Michael Parish in Atlantic City and professed her vows in 1960. 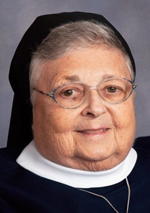 Sister Mary Jerome taught in the secondary schools in the Archdioceses of Philadelphia and Miami and the Dioceses of Arlington, Metuchen and Allentown. Her last assignment was at St. Hubert Catholic High School for Girls, Philadelphia, where she served for 16 years. The funeral Mass was celebrated at Camilla Hall, Immaculata, on May 7. Father Peter J. DiMaria was the celebrant and homilist. The concelebrants were Father William E. Dean and Msgr. Joseph Logrip. Sister Mary Jerome is survived by her brother Domenic (Frances), loving nieces and grandnephew, her local community from Immaculate Heart Convent at St. Hubert High School and her congregation of IHM Sisters. She was predeceased by her parents, Frank D. and Florence M. (Reale) Jerome.